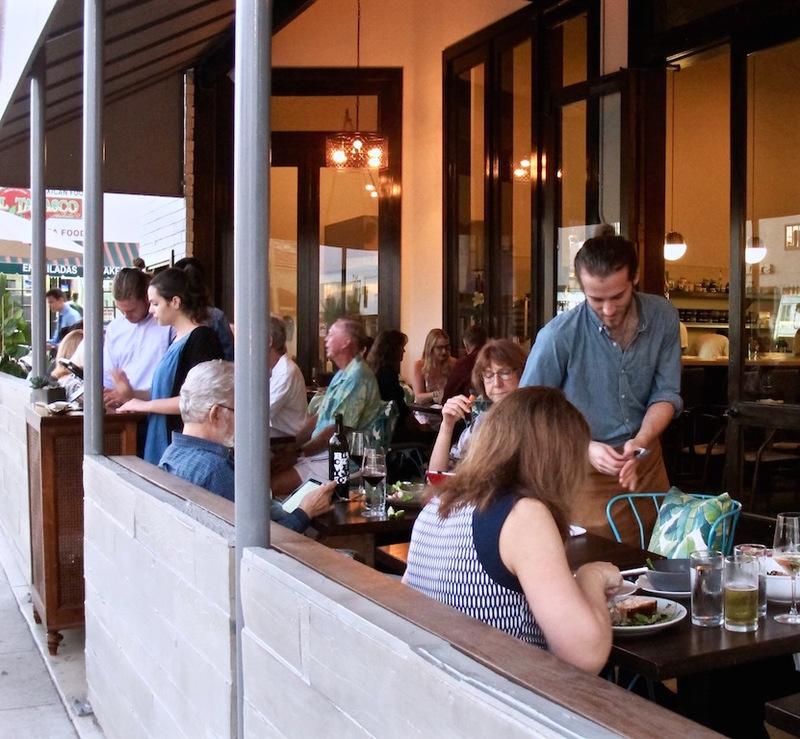 The westside continues to be rewarded with new restaurants. 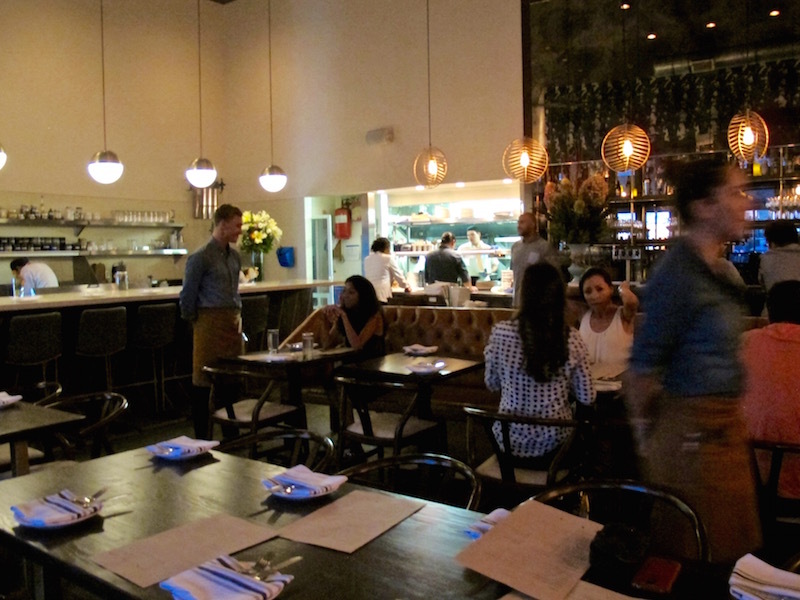 Another Top Chef contestant has opened another Los Angeles restaurant. Nyesha Arrington, last seen at the Wilshire, has opened Leona, steps from the Venice pier. So what's new and different? The space has been updated a bit from the former Canali Cafe tenant. There's still a decent size patio for some good Venice people watching. Inside it's loud due to the high ceilings. There are two bars, a few tables and a couple of a banquettes. Service is attentive. Maybe too attentive, but I suppose we could have worse problems. Our attentive server recommended the crudite platter which seemed like a snooze of an order. I can chop up my own veggies, but Leona offers a nice selection of multi-colored radishes, carrots, tomatoes and the most wonderful of dipping sauces. It was a well spiced curry hummus with olive oil, curry powder and tahini. It was a complete table pleaser. The flatbread was also a delight with heirloom summer squash blossom, lemon zest, espelette pepper and a nice sprinkling of a goat cheese. 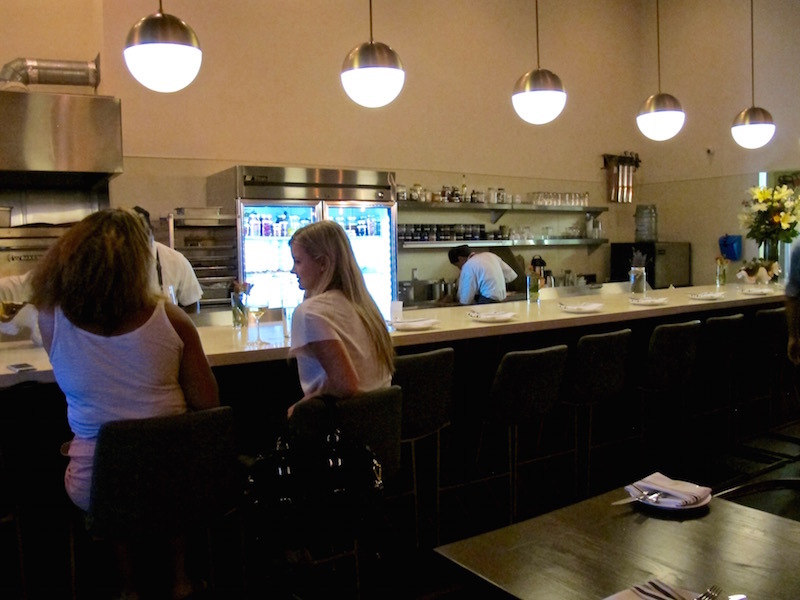 The most notable thing at Leona might be the short menu. It's one sheet, and not because they're used tiny type and an extra large sheet of paper. There's 6 entrees on the menu. I like that. They don't need to be everything to everyone. The mains do cover a lot of the bases like chicken, short ribs, trout and cod. Then there's a few twists with meatballs and lamb belly wontons. Since we were a group of 6, we made ordering easy and got every entree. The brick chicken had a thick, peppery crust on it and the flavors were locked in tight, retaining all the juiciness. It was further enhanced by slow roasted apricots. Winner. Ocean trout sat on a bed of crushed minty peas and was the least interesting to me, but with 6 people at the table, it was another person's favorite. Something for everyone. I liked the black cod better. It was delicate and subtle, served with a nice char in a sweet onion jus with japanese mustard greens. Packing a bigger punch were the meatballs de corazon made from beef hearts and surrounded by farmer's market beans and vegetables. This might need to be your go-to Thursday night order. The bulgogi braised short rib is in Nyesha's wheel house. Her grandmother is Korean so she knows what she's doing here. She even goes a step further and serves this spoon-worthy dish with roasted bone marrow, which I think brings new life to any dish. The winning entree for me was the lamb belly wontons with spinach and crispy artichoke. It was salty and savory and hit all the right notes in terms of texture and flavor. We had 4 desserts to choose from and we were slowing at this point so we only chose half, starting with the satisfying streusel cake with berry compote. The dessert that you're really here for though is the adult froster flakes. Cereal for dessert? Yeah, you want it. Flakes are served with warm, slightly sweet rice pudding and condensed milk. You may not want your kids to have it. They'll never go back. Nor will you. There's no cocktails at Leona, but the beer and wine list do the job and include a good selection at good prices. Leona is proving that you don't need 25 choices of everything to make a good restaurant. You just need to make a few things well, and Nyesha is doing just that at Leona.